"It was fun to be the only Americans in this very local Italian setting. The food was incredible and everyone treated us beautifully. I’m thrilled we could add this festival setting to our Tuscan experience." 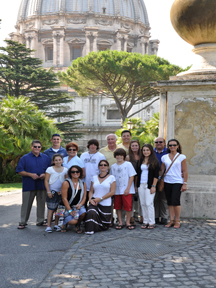 We love creating customized tours for your Italian Adventure. Designing Italy will work with couples and groups to create a special itinerary for Italian city tours, culinary adventures, Italian family heritage quests, photography, yoga, architecture, anniversaries, family & friends reunions at lovely luxury villas and more. We also sponsor hosted trips with amazing Italian hosts who bring us to authentic Italy. Take a look under our Wine and Food Tours for a special Harvest Tuscany Wine and Culinary Tour.